"This recipe was given to me by my friend Gloria 15 years ago. I have used it ever since then. No other dressing will serve the purpose, according to my adult son." Melt butter in a large skillet over medium heat. Cook onions, bell pepper, and celery in butter until tender, but not brown. In another pan, cook sausage over medium-high heat until evenly browned. 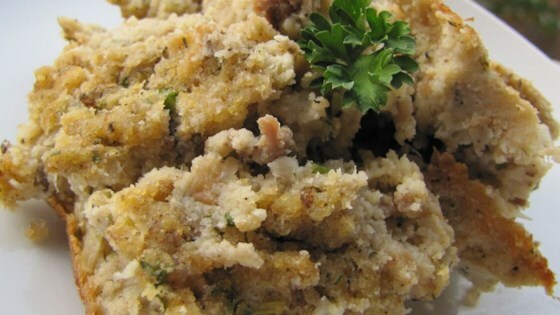 Place corn bread and bread slices in a food processor. Pulse until they turn into a crumbly mixture. Transfer mixture to a large bowl. Season with sage, thyme, poultry seasoning, salt, and pepper. Mix in chopped parsley, cooked vegetables, and sausage with drippings. Stir in eggs and chicken stock. This mixture should be a bit mushy. Transfer to a greased 9x13 inch pan. This turned out great! I did use a little less broth; about a 1/2 cup less. The flavor was wonderful. A keeper!